In New Mexico, August is for savoring summer’s bounty and celebrating Native traditions. This month, food stands across the state will be serving up Navajo tacos, a.k.a. Indian tacos, at events like feast days at the Santa Clara, Santo Domingo, Zia, and Picurís pueblos; at the Gallup Inter-Tribal Indian Ceremonial; and at the Santa Fe Indian Market. An adaptation of the conventional variety, Indian tacos use fry bread in place of tortillas for a more savory flavor—but fry bread is heavier, too. Taking both tradition and nutrition into account, Diné (Navajo) chef Walter Whitewater and I concocted a new variation. 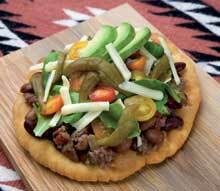 We prepare smaller portions of the fry bread itself, and focus instead on a healthy topping incorporating organically raised bison meat, organic pinto and kidney beans, local baby lettuce and arugula salad greens, heirloom tomatoes, avocados, and daikon radish sprouts. The bison meat we use is raised locally by Picurís Pueblo, a member of the InterTribal Bison Cooperative (ITBC). This program’s goal is to build a healthy, sustainable food source for the Picurís, and to reduce diet-related diseases such as diabetes, heart disease, and obesity. If you haven’t tried the pueblo’s bison, you may come to prefer it to beef—it has more flavor and less fat. Hearty tacos like these are nicely complemented by a veggie dish, using late summer’s plentiful zucchini and yellow squash. Today a traditional New Mexican dish, calabacitas was first made by indigenous people, then adopted by the Spanish who named it “calabacitas” or “little squash.” The dish can be made with any squash in season, such as zucchini and yellow squash in summer or butternut squash or pumpkin in the fall. True, there are New Mexicans who say they don’t like calabacitas; I say, “You’ve never had good calabacitas!” For such a simple dish, the technique and the recipe are everything. The calabacitas recipe I’m sharing here is a contemporary version of an old favorite, combining fresh summer zucchini and yellow squash with sweet carrots and spicy New Mexico green chile. Made incorrectly calabacitas can be watery and mushy. Trust this recipe to produce a crisp-tender, summer vegetable medley. The ingredients matter, too. I head to the Santa Fe Farmers Market for the freshest squash I can get. Small to medium sized squash works best. (Larger summer squash promise more water—and runny results.) Make sure the squash is firm to the touch, has few or no dents, and has smooth, unwrinkled skin. I know once you try this calabacitas recipe, you’ll come back to it again and again. 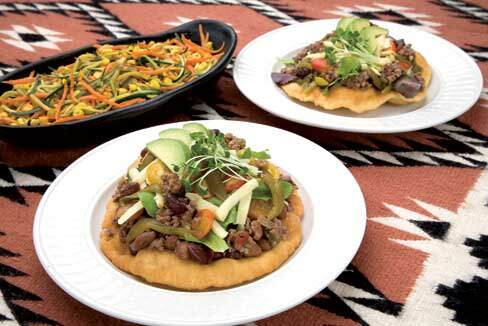 This recipe is a delicious way to enjoy a fry-bread taco topped with healthy, sustainably grown ingredients. In cast-iron skillet or frying pan, heat olive oil until hot. Add ground meat. Using slotted spoon or potato masher, break meat into small pieces as it browns. Cook about 5 minutes, until completely brown, stirring to prevent burning. and kidney beans and stir. Add salt, 6 tablespoons of green chile, and stir again. Cook 1 minute more, stirring to prevent burning. Remove from heat. Spoon meat-and-bean mixture atop freshly made fry bread, then top with greens, tomatoes, cheese, more chopped green chile, avocado, and sprouts.